Lots of birds around today, but instead of taking pictures we decided to take advantage of the good snowman making snow, nice and sticky. We used a sliced sweet potato for buttons. Chris dropped a piece on the way inside, and later we saw a squirrel eating it. The bottom photo is not a picture of the squirrel who liked the sweet potato. This squirrel is affectionately named by us So Teeny. 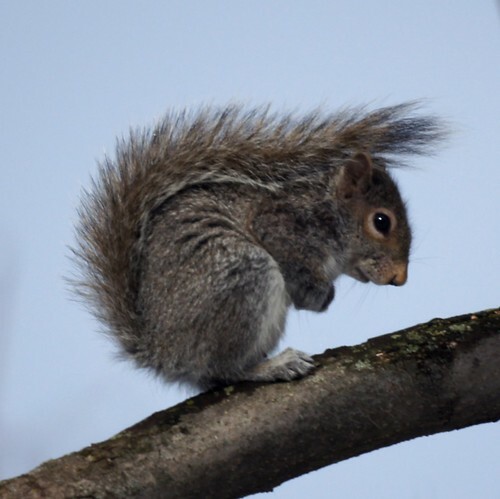 It is much smaller than all the other squirrels and often comes by alone for a snack. If we keep feeding it, maybe it will catch up to the others. Here's another photo of So Teeny.